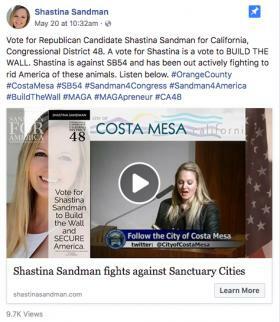 Shastina Sandman is in a primary on Tuesday but can't buy Facebook ads. Shastina Sandman is waiting for a letter from Facebook, coming by U.S. mail, that she hopes will contain a verification code to buy ads for her upcoming primary in California's 48th Congressional District. She's running out of time. The primary to determine who will advance to the November general election is Tuesday. Sandman is caught in Facebook's new, stringent vetting process to approve political ads, a response to foreign meddling in the 2016 presidential race. Some candidates from Florida, Mississippi and other states say they have been impacted as well. Implemented in late May, the timing of the election integrity measure seems to be hitting hardest states like California that are in the middle of primaries. The policy requires candidates and political groups verify their identities and locations and then wait for a code, by snail mail, that lets them make those ad buys on the social network, and some challengers claim the new rule hits them harder than it does incumbents. When it was nine days out from the election, says Sandman, "I get this disapproval notice from Facebook about a video that had already been running as an ad. That's ridiculous." A Republican and Donald Trump supporter, Sandman is running for the seat held by Republican Dana Rohrabacher. More than 10 candidates will appear on that primary ballot on Tuesday, and the top two finishers, regardless of party, will compete in the general election. Sandman has a Facebook presence; she runs a page called Magapreneur, a play on Trump's "Make America Great Again" catchphrase, which she uses to promote Trump-themed merchandise. But that page and her personal Facebook page were blocked from buying ads until she could verify her identity. Sandman thinks incumbents like Rohrabacher have millions of dollars and massive staffs to help with just these kinds of hoops and hassles. "I understand Facebook wants to verify candidates but by doing it like this it almost seems like meddling in elections," Sandman says. Facebook says it has been trying to find a formula that balances the need to take control of the abuse on the platform with the need to stay out of sensitive political matters. But the new policy seems to mean some candidates in heated races can pay to boost their messages to voters, while others cannot. Mark Meuser, a Republican candidate for California state secretary of state was recently caught up in the verification protocols, too, saying he couldn't promote a video he created about "illegal voting." "Facebook gives challengers like me a much better opportunity to get a message out for less money," Meuser says, explaining why his timeout from advertising has been such a disadvantage. On Friday, Meuser said he was still talking with Facebook representatives who seemed to want to help him fix the issues he was having. The issue is bipartisan. "It's happening to Democrats, too," says Adriel Hampton, creative director at his political consulting firm, The Adriel Hampton Group. "I was shut down for a few days but had a team member who was verified. The hard part is the letter takes more than a week. So that's what's really frustrating people." Facebook had notified Meuser and Sandman in routine reach-out efforts, according to a company spokeswoman. "We're committed to helping advertisers as they go through this process. At the same time, it's incredibly important to verify political advertisers so we can help prevent bad actors from interfering in elections. Doing this won't be perfect to start, but the important step is to start," says Katie Harbath, Facebook's global politics and government outreach director. Facebook has been telegraphing its moves for months now, with public blog posts, notices sent to pages and e-mails, it says. In April, it announced the identification process and started notifying pages it determined would be most likely to be affected. The identification requirement officially took effect in the last week in May. Republican Richard Boyanton, who is running for senator from Mississippi, tweeted that he wanted a primary do-over because Facebook cut off his ad spending. "I am starting to push to have this election redone," the candidate tweeted on Thursday. "The Facebook canceling our ads puts the election as bias to incumbent because of denying our ads 10 days before June 5th election. Facebook should pay for the new election." Hampton, however, says candidates should have been more prepared and capable of following the warning signs. "I think it's a screw up by consultants," Hampton said. "Just because Facebook has a complicated interface you can't ignore real ID requirements." Facebook new requirements come after it uncovered 475 fake accounts that had purchased some 3,000 political ads in an attempt to influence the 2016 presidential race. YouTube and Twitter were similarly attacked by bad actors, and all the companies sent representatives to Congress to testify last year about the disinformation campaigns on their platforms.